This is an experiment for me. I’ve never before written a review 7 weeks after a film’s release ... But then, some reviews I write because I have to; some because I want to ... Because there’s such joy in sharing my thoughts about a film I loved. I suspect too that most people read reviews not just for help with their film-viewing decisions, but because there is such joy in finding your opinions echoed by someone you respect or in cursing critics whose views don’t match yours. You’d think people refer to reviews only on the weekend of a film’s release, but my experience with Kahaani proves otherwise. As some of you are aware, I’m working on my first book. So I was battling a deadline in March that compelled me to miss the film when it was released. I’m pleasantly surprised to find though that between March and today I’ve received numerous tweets from regular readers of my blog urging me to review this film whenever I am free. This is a unique experience for me. As a practice, I rigidly refuse to discuss a film with a soul if I intend to review it and I avoid reading other reviews till I’m done with mine. Although I’ve not chatted with anyone about Kahaani so far or read reviews before writing my own, I’m obviously aware that most reviewers and viewers have praised it, though a couple of critics did not like it as much. The film is now in its 7th week in theatres (very unusual these days even for high-cost productions). Made on a budget of merely Rs 8 crore, Kahaani had already collected nearly Rs 58 crore in its 5th week according to the trade website boxofficeindia.com. But an acquaintance buttonholed me to insist that the climax was “too abrupt” and undeserving of the accolades. As I walked into the theatre to watch it many weeks after its release, I wondered if, after all the post-release hype, I too would be disappointed. As it turns out, I’m not. There’s only one way to describe my reaction to that ending … Oh my! I did not see that coming! So the first A-plus in favour of Kahaani is for effectively exploring a genre which is one of Bollywood’s weaknesses. This industry rarely makes good thrillers – for evidence, look no further than the hollowness of Agent Vinod. 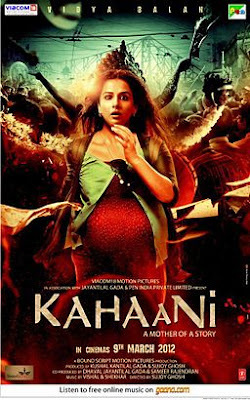 But Kahaani manages to maintain the suspense till the very last shot. I was so glued to my seat, that I didn’t step out for snacks during the interval for fear that I would miss a few significant seconds. You know of course that this is the story of a seven-months pregnant Vidya Bagchi (Vidya Balan) who travels from her home in London to locate her husband who went missing while on an assignment in Kolkata. Strange thing is, no one in the city seems to recollect an Arnab Bagchi. A young policeman called Satyaki Chatterjee (Parambrata Chattopadhyay) steps up to help. Intelligence official Khan (Nawazuddin Siddiqui) is unmoved by Vidya’s plight but is keen to use her to solve a case. Kahaani is one of those rare Hindi films that marries intelligent casting with a wonderful script. Actors for even the tiniest roles have been chosen with affection for the writers’ vision. So not only do the three leads deliver remarkable performances, but you come away from the film remembering even Saswata Chatterjee playing the destined-to-be-iconic Bob Biswas, the eerie undercover contract killer whose total screen time would not add up to many minutes. Too many films put a strain on their actors by getting them to do accents and imitate the body language of people from communities they do not belong to. It takes a rare actor to manage the feat without distracting themselves from the rest of the performance. Kahaani makes no such unnecessary demands. Bengalis here are played by Bengalis. And Vidya Bagchi is actually a Tamilian married to a Bengali man (Vidya Balan herself is a Palakkad Iyer). It’s also a relief that there’s more to the actress’ fine performance than just the physical demands of playing a pregnant woman. Although her character is experiencing great trauma, for not a second does she overdo the emotions. Bengali actor Parambrata – making his Bollywood debut here – is the sort of chap you want to reach out to hug when you see him on screen. But beyond the cuteness, his immense talent is exemplified by the scenes in which he gives us a whiff of a glimpse of Satyaki’s growing attraction towards Vidya. As for Nawazuddin, you may remember him as the local journalist reporting Natha’s story in Peepli Live. In Kahaani, he gets a larger showcase for his undeniable skills and sharp good looks, leaving us anxious for more. But the stars of this film are director Sujoy Ghosh, cinematographer Setu and the writing team (story: Ghosh & Advaita Kala, additional screenplay: Suresh Nair & Nikhil Vyas). Together they utilise Kolkata with all her familiar and unfamiliar scenes, without resorting to grating clichés; and subtly but surely they present to us a truly feminist film. Since Durga Puja forms the backdrop of Kahaani, I was dreading a literal depiction of Vidya as the many-armed Goddess at some point, as she is seen in the poster. Fortunately, the film not only steers clear of such triteness, its woman-centricity goes way beyond the usual heroine-oriented Hindi film with the clearly spelt out focus on social issues! Pregnancy and childbirth are arguably the physically most vulnerable times in a woman’s life. But Vidya Bagchi in her advanced stage of pregnancy is not just determinedly mobile, she also proves that a woman’s physical susceptibility should not in any way overshadow her emotional resilience. More important, pregnant women often see themselves as unattractive, and Indian society tends to expect them to stay away from public platforms. It’s only in recent years that pregnant actresses have begun making routine public appearances. But how many pregnant Indian female TV anchors have you seen with their baby bumps visible on air? Not many, I’m afraid. In this context, Kahaani adds a whole new dimension to its understated feminism by pointing us towards the possibility that a man may very well be attracted to a pregnant woman who, as it happens, does not measure her worth by his interest in her. Besides, Vidya is at no point depicted as dowdy. She is smart, feisty, brilliant, beautiful, pregnant and utterly irresistible. These serious subliminal messages only add to the fun that is to be had in watching Kahaani! You may choose to wait for it to be aired on TV. But there is something to be said about seeing a disturbing thriller in a darkened hall. I’m sorely tempted to make a second trip! as you rightly said it is one of the rare bollywood thriller, this film explores more for audience and I truly enjoyed it. Oh, loved the review. Glad you did this! Do go for a second watch, i did. I came to your page looking for Tezz review to decide if I should watch it, but you made me want to watch this again.